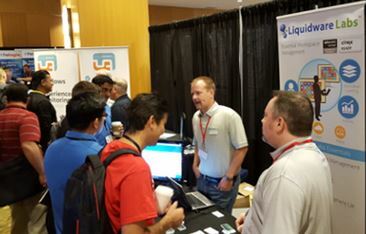 BriForum Denver 2015 – Show Wrap Up! I just got back from several days at BriForum, the Tech Target Brian Madden VDI and Virtual love fest. I say that affectionately. It’s the event to be at if you are a Virtual guru, industry blogger, or product manager in the industry. It’s not a huge show, so if you have not been you are in the majority, but it is VERY focused. We were showing off our Essentials Workspace Management Suite. There was a lot of interest as we’re nearing the r elease dates for a big update of our flagship solutions ProfileUnity, FlexApp, and Stratusphere. There were sessions on Application Layering, a bake off session on Citrix XenDesktop and VMware Horizon and a whole lot more. I got to sit down with Brian Madden and gave him a good update. I got to give him a demo of ProfileUnity & FlexApp v6.5. We also had fun catching up and talking about all that’s happened in the industry in the past year. 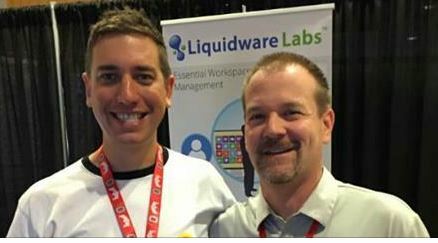 He’s followed our products since before there was a Liquidware Labs so he’s seen them come a long way. I can’t speak for him but look at this smile he had afterwards. I also got to touch base with several partners there such as CDI, KIS, and many more. The sessions were great. Many of them were delivered by Citrix CTPs and were spot on for what the audience seemed to want to know. The sessions was in were interactive with a lot of Q&A. Is there a recording link for the Citrix webinar you reference Jason?